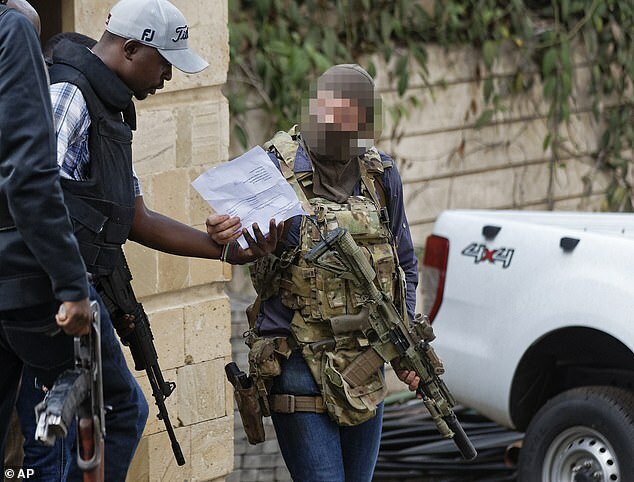 A British SAS hero allegedly jumped in to fight a group of Islamist terrorists who launched an attack on a luxury hotel in Kenya, killing 14 people, on Tuesday. Photos from the scenes yesterday show the man with combat gear over a casual jeans and purple shirt storming the building and rescuing civilians. 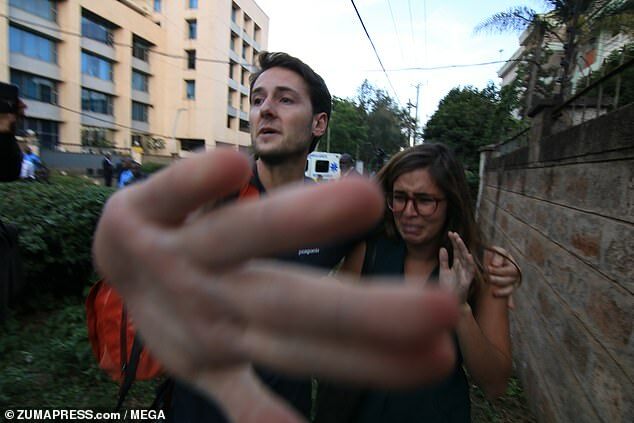 Tuesday’s terror attack at a hotel and office complex in Nairobi saw four gunmen kill 14 people, including a British man and an American woman, after detonating car bombs outside. 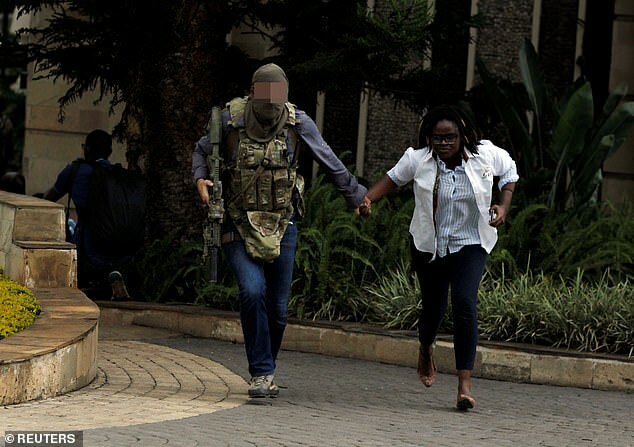 The British man was reportedly in Nairobi to train Kenyan Special Forces when a request for help went out to local forces. 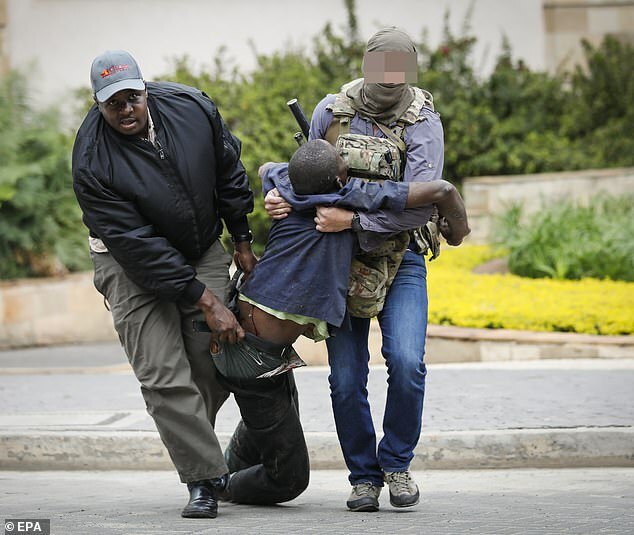 ‘He was there training and mentoring Kenyan forces when the shout went up, so they went in,’ an insider told The Sun. ‘During the operation he fired off some rounds – it’s safe bet he hit his target – the SAS don’t miss. 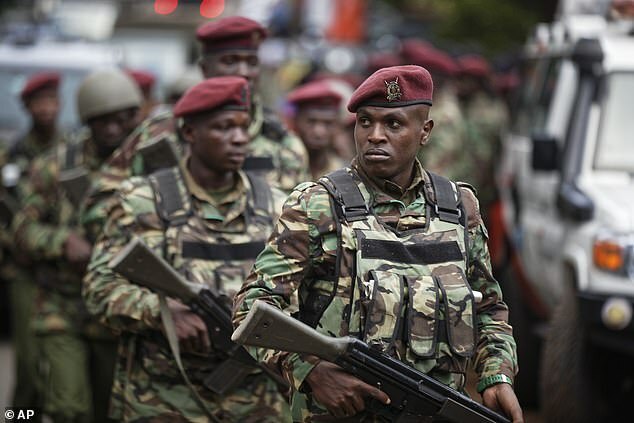 The Sun’s source claimed the British SAS-man was joined by US Navy Seals in aiding Kenyan Special Forces yesterday. When contacted by MailOnline, the Ministry of Defence declined to comment on the report. 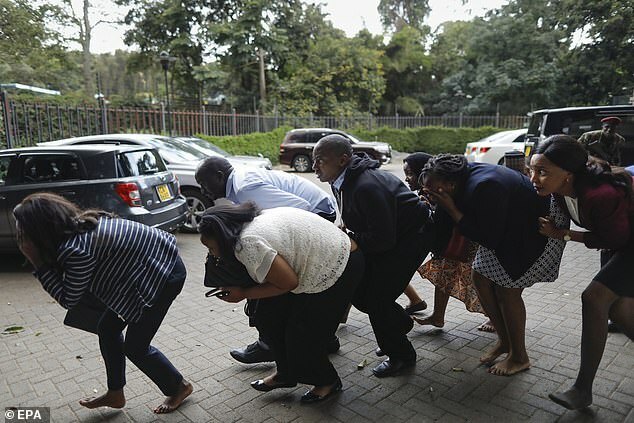 The four attackers, one wearing a green belt laden with grenades, were seen on CCTV blasting their way into the hotel and office complex in Nairobi after detonating car bombs outside a nearby bank. 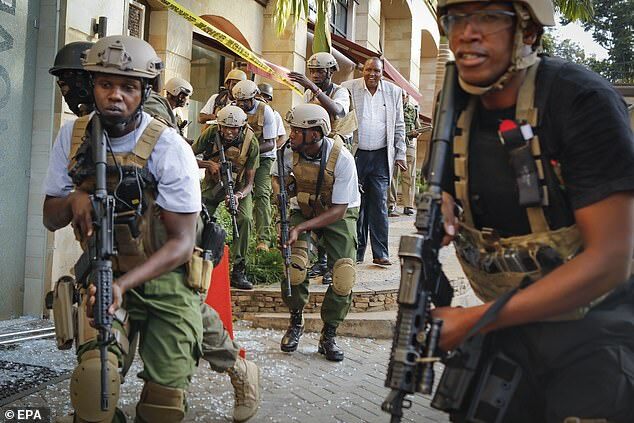 President Uhuru Kenyatta said this morning that all three remaining attackers had been eliminated overnight and that the security operation is now over. 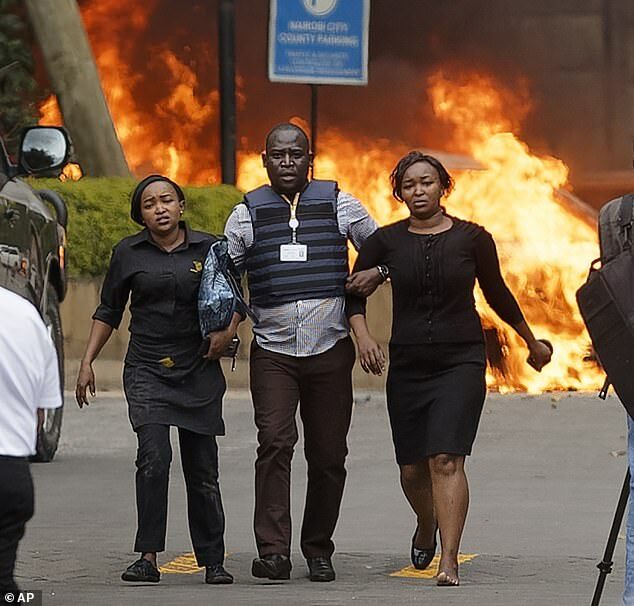 Kenyatta said that 14 civilians have been confirmed dead and that more than 700 people had been evacuated to safety from the the 14 Riverside Drive complex – which includes a large hotel known as DusitD2, banks and offices. Somali Islamist militant group al-Shabaab, which has links to al-Qaeda, claimed that it was behind the terror attack. 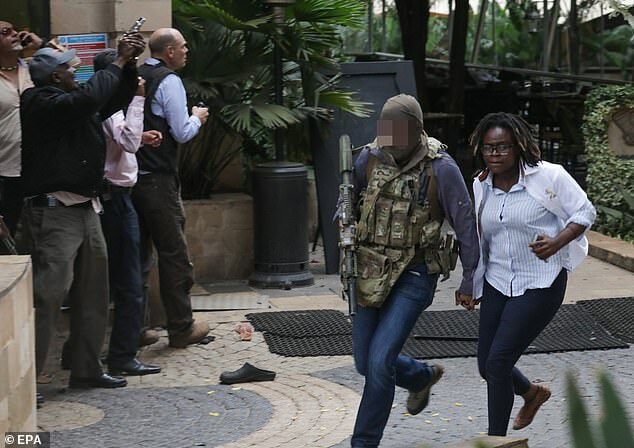 Al-Shabaab carried out the 2013 attack at the nearby Westgate Mall in Nairobi that killed 67 people. The UK Foreign Office has today confirmed that a British man was killed in the attack, and that another British citizen was wounded. It is understood the man who died was of British and South African dual nationality. The US State Department said an American woman had also died in the attack. London-based company Adam Smith International also said two employees were killed in the attack. Abdalla Dahir and Feisal Ahmed were killed on the terrace of a restaurant in the complex where the company has Nairobi offices, the company said in a statement.